A glassy, translucent stone, carnelian is a orange colored variety of chalcedony and called "the setting sun" by the ancient Egyptians. This necklace is asymmetrical in design. Argentium silver is used in the creation of wire links and the herringbone bead wrap. Toogle clasp is sterling silver. Necklace measures 30½ inches and weighs 2 oz. 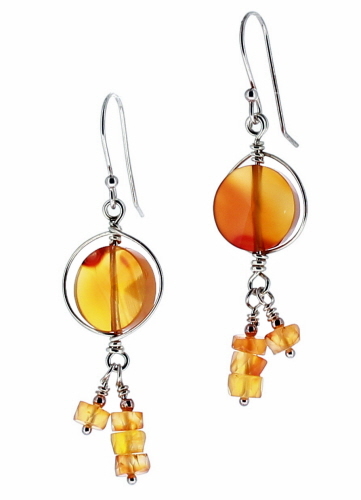 Earrings measure 2⅛ inches from top of earwire to bottom of dangle and weigh 0.1 oz each. 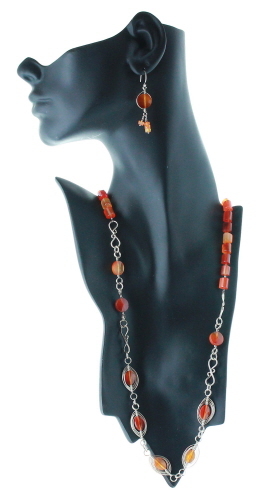 Argentium and sterling silver is used.